The Pediatric Dermatology of the Philippines in Partnership with Galderma, makers of Cetaphil, invites all moms and dads to attend this year's Kutis ng Bata - Alagang Derma child skin care clinic. Like last year, pediatric dermatologists will share tips in taking care of the skin of our babies, toddlers, and older kids. 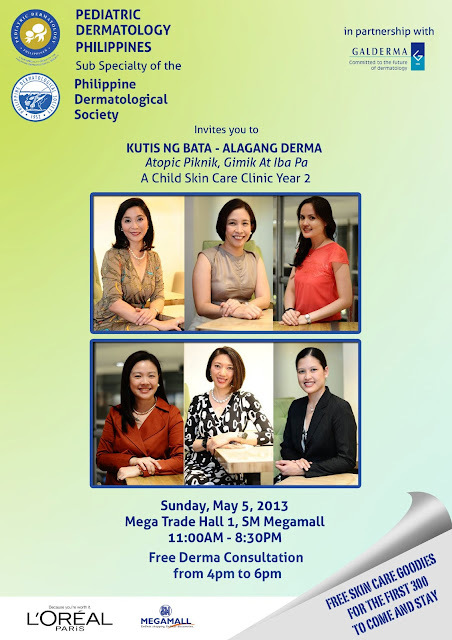 This event will happen on Sunday, May 5, 2013 at the SM Megamall Megatrade Hall 1. The first 300 participants to stay will get free skin care goodies. Meanwhile, be sure to take advantage of Cetaphil's "Get 2 for the Price of 1" promo and stock up on our favorite Cetaphil products! This promo is held in commemoration of Cetaphil's 65 years of being the most prescribed brand of cleanser and moisturizer by dermatologists and pediatricians. 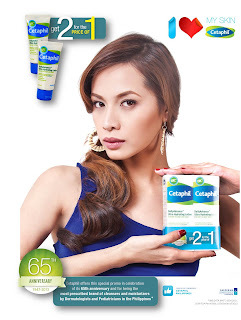 LIKE Cetaphil Philippines on Facebook (http://www.facebook.com/CetaphilPhilippines) for more details and to stay updated on the latest events and promos!